Foot doctors and staff at Advanced Foot and Ankle Specialists have been proudly serving patients in the Greater Houston area for more than a decade. We use state-of-the-art technology to minimize pain and healing time. We have in-office x-ray, ultrasound, shockwave and laser capabilities to enable our physicians to quickly diagnose and accurately treat patients. Dr. Lee was raised in Houston. Prior to his medical training, he attended the University of Texas at Austin, graduating with a Bachelor of Arts degree in Biology. Subsequently, he attended the New York College of Podiatric Medicine and graduated at the top of his class with his Doctor of Podiatric Medicine. Dr. Lee then completed a three year residency at St. Vincent Catholic Medical Center in New York City. His residency focused on medicine and surgery of the foot and ankle, with emphasis on reconstructive rear foot and ankle surgery. During his final year of surgical residency, he had the distinction of being appointed chief resident of his program. Dr. Lee has the distinction of being Board Certified in both reconstructive foot surgery and ankle surgery by the American Board of Podiatric Surgery. He is on staff at several area hospitals, including Methodist Sugar Land, Memorial Hermann Sugar Land and Memorial Hermann Southwest. He enjoys meeting and treating all types of patients. Dr. Lee lives in Sugar Land and speaks Chinese Mandarin fluently. 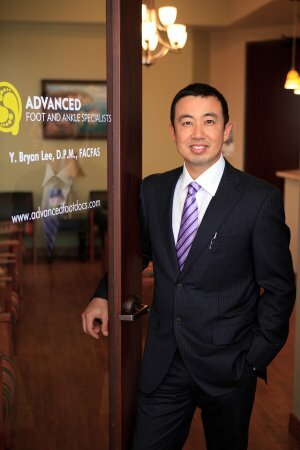 Dr. Lee is a Fellow of the American College of Foot and Ankle Surgeons as well as a member of various professional societies such as the Harris County Podiatric Society, Texas Podiatric Medical Association, and American Podiatric Medical Association. Dr. Lee often serves as medical staff at athletic fundraising events for not-for-profit organizations in the Houston and Sugar Land areas.